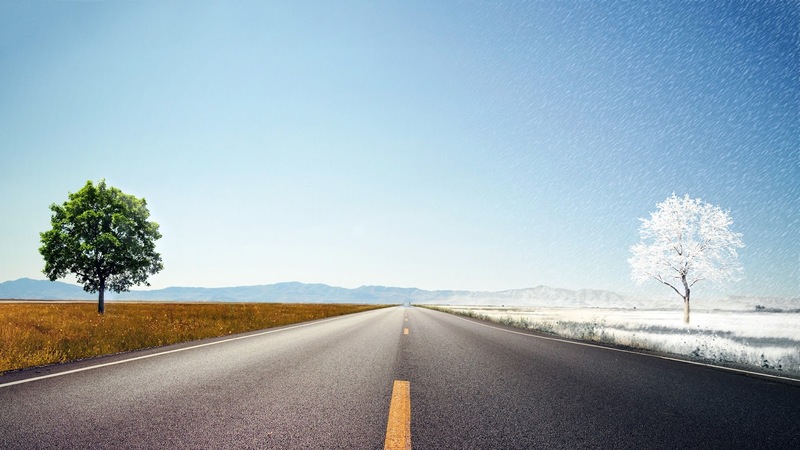 As I mentioned in my last post, when I analyzed how the items on measures of attachment to God grouped up all the items related to relational distress grouped together. And when I examined this group of items they looked a lot like the content found in the lament or psalms of complaint. So I called this dimension complaint. Along with these complaint items there was a second grouping of items in the analysis. These were more positive items and when I looked over these items I saw a common theme of engagement with God. So I called this dimension communion. Now here was the critical insight from the analysis I conducted. I'd identified two dimensions that captured relationship with God--communion and complaint--and these two dimensions were orthogonal (at right angles) to each other. 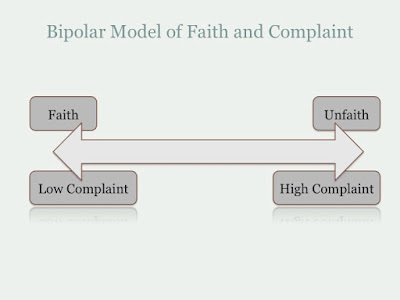 The assumption of this bipolar model is that as complaint increases faith decreases. Conversely, a strong faith is characterized by a lack or absence of complaint, a lack of doubt, protest or lament. Like with the attachment research this bipolar model effectively pathologizes complaint. Any doubt, questioning, protest, anger or distress in your relationship with God is taken to be, in this model, as symptomatic of a lack of faith. We can see here Walter questioning the central assumption of the bipolar model, that complaint is antithetical to faith: "We have thought that acknowledgement of negativity was somehow an act of unfaith." 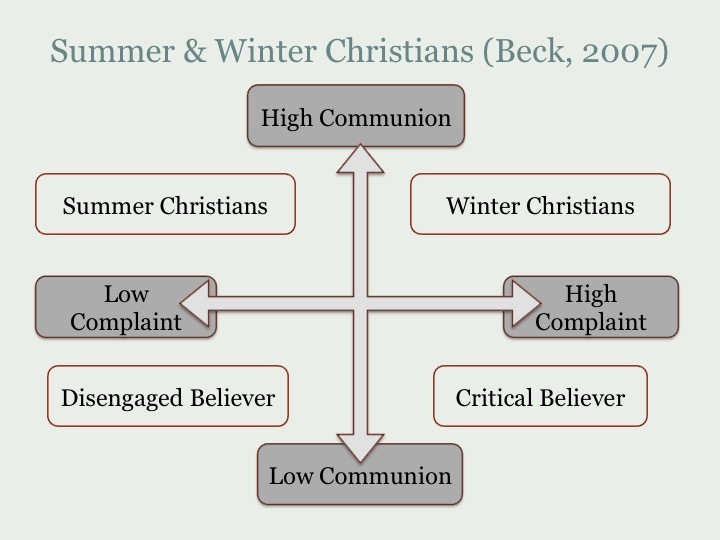 In the Winter Christian experience there is a great deal of complaint--lament and protest--but engagement/communion with God remains high. This is exactly what we see in Job and the lament psalms. Even with Jesus's cry from the cross. 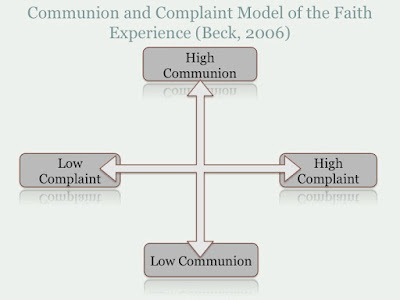 And what this means is that communion and complaint are not antithetical. Communion and compliant can co-exist. And when they do they create the Winter Christian experience. And this is ultimately why I moved away from the attachment paradigm. 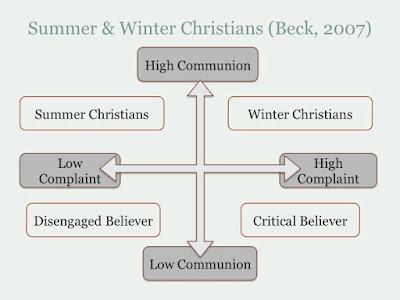 Specifically, in contrast to the attachment styles framework the Winter Christian paradigm depathologized lament. In this model lament could be a natural, regular and even a healthy feature of faith. In this model you are not anxiously or insecurely attached to God. You're just a Winter Christian.